Visit your local Cicis today to enjoy an adult buffet for only $4.15 (tax day!) by purchasing a large drink in combination with a coupon. Call ahead to ensure they are participating in this offer, and to save time too. It may be super busy. Purchase a large drink and show this coupon. 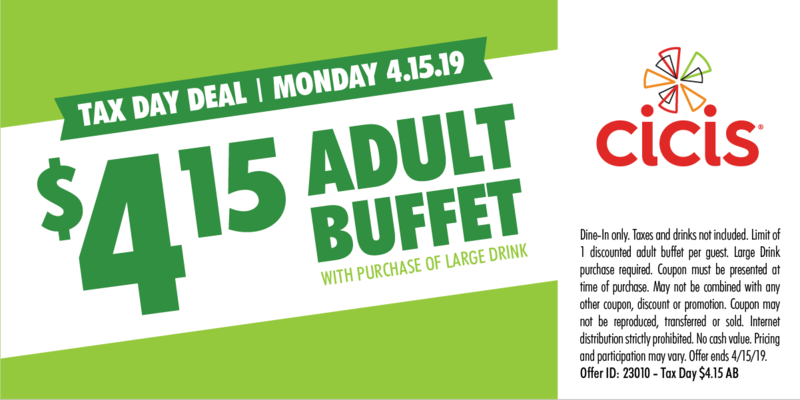 Enjoy a well-earned adult buffet for only $4.15. * US only. Dine-in only. Limit of 1 discounted buffet per adult. Coupon required and large drink purchase required. Ends 4/15/2019.